Mayor Jo-Anne Albert declared a state of emergency for the Municipality of Tweed due to wide-spread flooding, which affected our municipal infrastructure including roads and posed a threat to individual properties. Flood Recovery Package - includes a homeowner`s checklist for after the flood, information on private septic systems flooding, information on drinking water affected by flooding, and a disinfection instruction sheet. Residents were encouraged to take measures to protect their properties and to evacuate in severely flooded areas. Most rural roads had localized flooding and residents were advised to be extra cautious and pay attention to signs. A road may look safe at present but can quickly wash away with the amount of water that was running over them. Residents were advised to contact the Municipality of Tweed if they need assistance with relocation. We have continued to post updates on the Municipal website and facebook pages. Quinte Conservation staff are working around the clock and are available for individual property assessments, please contact 613-968-3434 and follow their website for ongoing flood statements. Residents have been advised to be prepared as our lakes, rivers, streams and creeks swell with more water than usual at this time of year. Sandbags and a supply of sand are available for residents at the Stoco works garage on Marlbank Road for use at their homes. An instruction sheet for proper sandbagging is at the same location. We urged you to be pro-active in protecting your property from the effects of flooding. 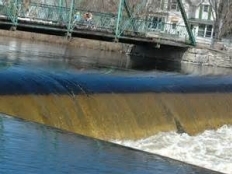 Click here to access the April 23, 2014 Flood Message from Quinte Conservation. For more information about water levels and all the updates to the area flood conditions visit the Quinte Conservation website. Residents relying on water from wells in flooded areas are advised not to drink water from their private wells during a flood situation. More information about flooding in relation to private wells is available on the Hastings & Price Edward Counties Health Unit website or call the Health Unit at 613-966-5500. Click here for a direct link to the Health Unit Warning issued April 10, 2014. Water from private wells should be tested following a flood situation. Water sample bottles are available at the Health Unit or at the Tweed Municipal Office, 255 Metcalf St., Tweed. All testing is done by the Health Unit so samples must be delivered to their offices. Residents are also encouraged to visit our Emergency Management page regularly to familiarize yourself with its contents and to know how to be prepared in the event of an emergency.